It is Outdoor Wednesday hosted by Susan at A Southern Daydreamer and I have but one photo to share. My BB Guy and our youngest son were at our cabin last weekend and they went out to collect some flat rock to use to surround the giant fire pit at the cabin. They went up the hillside to get some flat slate that was leftover from when the area was blasted for rock to fill in some caved in roadways. Boy was that some back breaking work. They lugged the rock down the hill to the truck and then unloaded them at the cabin. The soreness factor was pretty big around here when they got back. It was a long way up to get the flat pieces. I hope to have pictures of the finished fire pit one day. Maybe for a Met Monday. I'll bet the fire pit is great, look forward to seeing the pics! 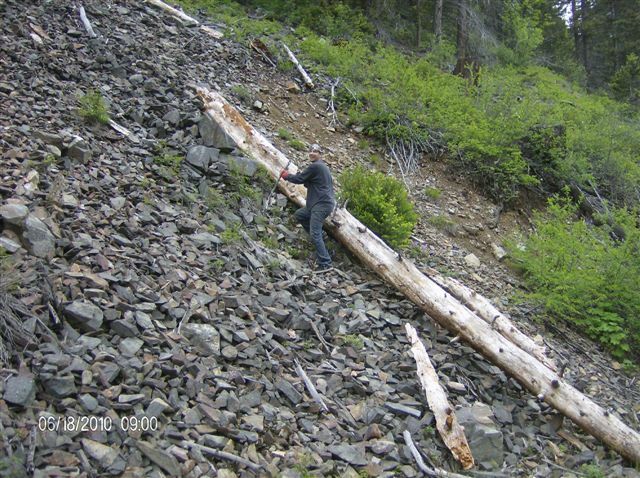 That looks like a steep hill to do this rock collecting job! Will wait to see your fire pit! Now that takes dedication! My back hurts just reading about this ordeal, but the payoff will be worth the effort! Good job to have done, but it's way more rewarding to forage and slug than to just go buy it and have it delivered! I'll be waiting for the pictures of the fire pit and some toasted marshmallows! Thanks for the comment. I agree with you. A dog is after all a dog. My feeder is not working. I tried to fix it but its beyond my capacity. I left messages here and there to Google but they say sometimes it happens. A lot of my "habituals" are complaining. I had someone design my blog and that's when the trouble started. I might ask her to see what went wrong. I read your Father's Day post. That is a beautiful tribute to your husband. I also cant wait to see pictures of the fire pit! Thanks for sharing. Thanks for a very nice, short and to the point post. I enjoyed seeing your family dragging that big pole. Hard work but, it will be worth it. I hear ya, Girl! Around here we move a lot of rocks and could use a few youngsters! PS, I think our BB Guys would get along great! Yep, that's what the young 'uns do best! Can't wait to see the finished pit!